Let’s make the Estria Art Battle and Festival happen again this year! 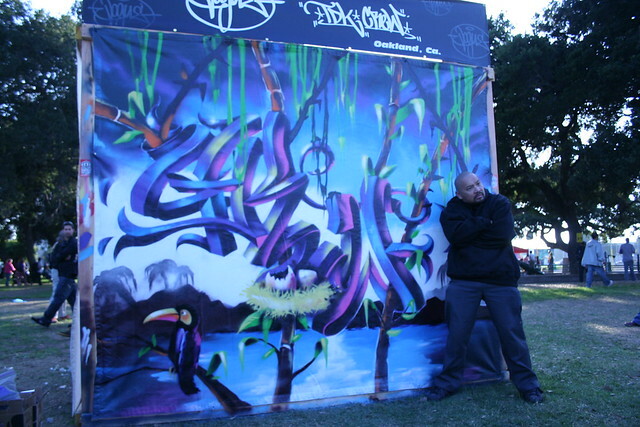 Home/Community, Graffiti Art/Let’s make the Estria Art Battle and Festival happen again this year! Estria Art Battle and Festival is back and need your help to raise funds for this year’s battle! Check out their kickstarter and let’s help them make this positive, community driven and art-polooza event happen! The Estria Foundation has launched a Kickstarter campaign to support the 6th Annual Estria Battle and Art Festival. It’s not only a one day event, but a a series of art events building community, promoting positive messages, and investing in the creative expression of young people. Donors to the Kickstarter campaign can select limited edition rewards like art prints by Estria, Favianna Rodriguez, Vogue (TDK), Apexer, Chor Boogie, Vyal One, Defer and other printmakers and street artists. The rewards also include prints of archived Estria Battle canvases, street art postcard packs, and t-shirt and hoodie designs by Jesse Hernandez. Donors at the highest levels can even have Estria create a mural for them. The Kickstarter campaign runs until July 11th and aims to crowd-raise $25,000 to help pay for items like canvases, supplies, food, travel costs, and construction fees. Those who wish to participate or learn more can visit http://ht.ly/lMzbM for the Estria Battle and Festival’s Kickstarter page or visit www.estriabattle.com. The Estria Battle brings 16 of the top urban artists to Oakland to battle in a live painting event rooted in positive community messages and social justice principles. The Battle is held at the Life is Living Festival in West Oakland on October 12th and is presented in partnership with Youth Speaks, Inc. After learning the word and theme of the day, spraycan artists have five hours to paint a positive, technically and creatively excellent large canvas while people of all ages enjoy. The Battle also includes a blackbook battle, a youth group painting competition and stencil workshop. Events prior to the Estria Battle day include an art gallery exhibition, an “Art in Public” slideshow and panel night and several school workshops, where visiting contestants bring classroom instruction to local Oakland schools.